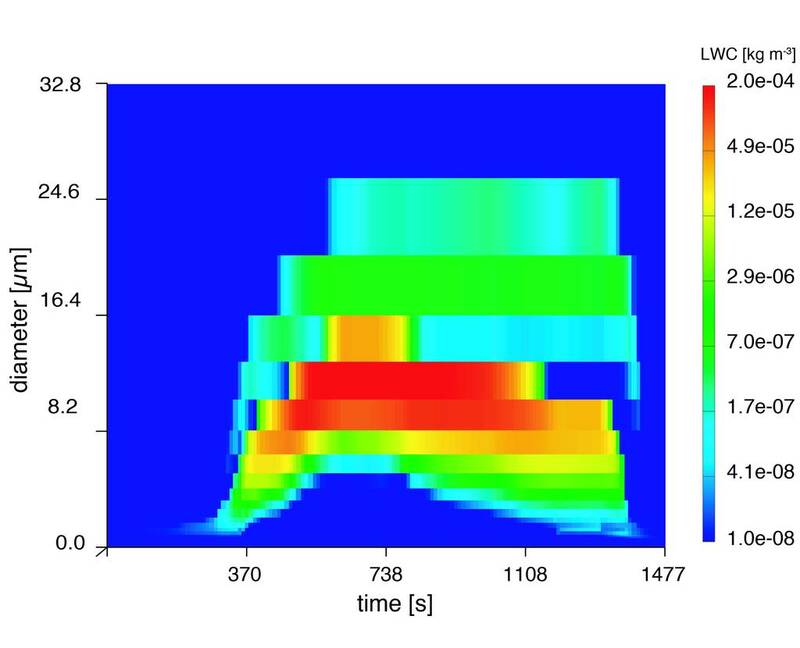 In order to examine the coupled microphysical and multiphase chemical processes in the troposphere by means of a complex numerical model, the spectral air parcel model SPACCIM was developed in the modelling department of the TROPOS. SPACCIM combines a complex size-resolved multiphase chemistry model and cloud-microphysical model. The interaction between both models is described by a coupling scheme (see Fig. 2) that allows the microphysical and chemical model to run so far as possible separately from each other, i.e. enabling both models to use their own time step control. The multiphase chemical system is integrated by a high-order implicit scheme, which exploits the special sparse structure of the model equations (Wolke and Knoth, 2002). The microphysical model applied in SPACCIM model framework is mainly based on the work of Simmel and Wurzler (2006) and Simmel et al. (2005). 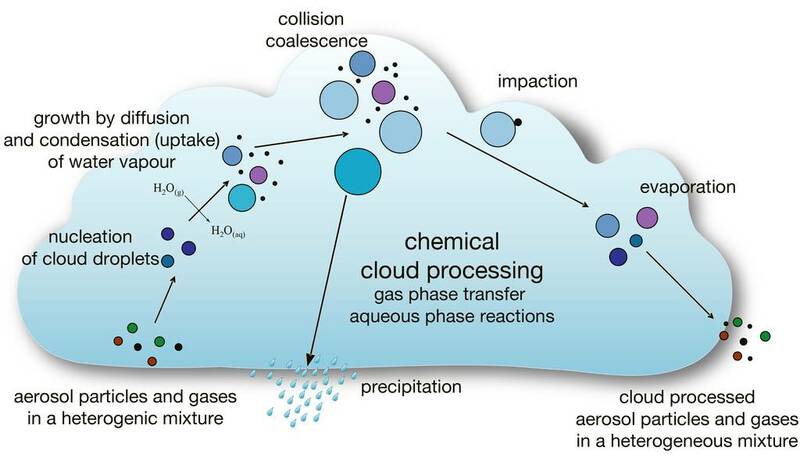 In the microphysical model, the growth and shrinking of aerosol particles by water vapour diffusion as well as nucleation and growth/evaporation of cloud droplets and other microphysical processes such as impaction of aerosol particles and collision/coalescence of droplets are described explicitly (see Fig. 1). The dynamic growth rate in the condensation/evaporation process as well as the droplet activation is based on Köhler theory. The cloud droplet formation, evolution and evaporation are implemented using a one-dimensional sectional microphysics considering deliquesced particles and cloud droplets, respectively. The microphysical model provides the meteorological and cloud microphysical parameters, such as temperature, humidity and liquid water content, but is also controlled by processes of the chemistry model. 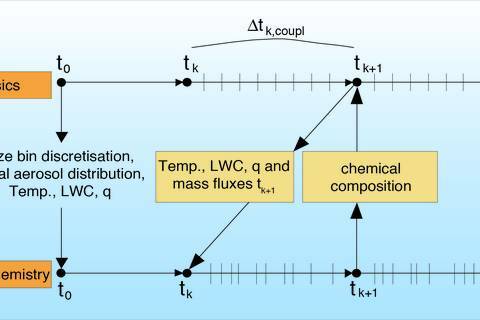 The coupling scheme accounts for the interpolation of the meteorological data as well as the averaging of physical and chemical mass fluxes that occur within the particle/droplet spectrum due to microphysical and chemical processes. 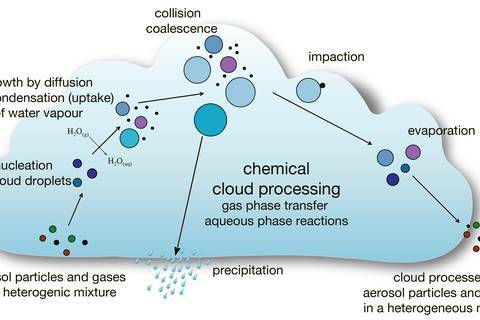 In SPACCIM, chemical mechanisms of different complexity can be applied for modelling the multiphase chemistry in both deliquesced particles and cloud droplets. The currently most advanced applied multiphase mechanism consists of the gas phase mechanism MCMv3.1 (http://mcm.leeds.ac.uk/MCM/) and the aqueous phase mechanism CAPRAM (Chemical Aqueous Phase Radical Mechanism, version 3.0i). In the past, SPACCIM has been used for several studies and applications (see references below) focusing on chemical processes in the tropospheric multiphase system. Besides the investigation on cloud processes, current studies deal also with deliquesced aerosol particles such as the multiphase organic particle mass processing and dissolution processes on mineral dust particles. 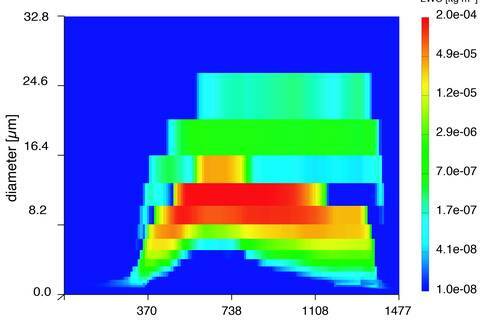 For this reason, an activity coefficient model has been recently implemented in SPACCIM that considers the effect of non-ideal solutions and the feedback on the multiphase chemistry.